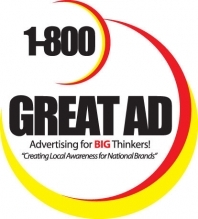 1-800-GREAT AD is a national, end-to-end outdoor advertising company with a proven track record of increasing “Local Awareness for National Brands”, retail traffic and sales to chains throughout North America. We are also home of the Innovative Outdoor Solutions (IOS) Team. We are an idea-driven, creative resource for advertisers who need to reach the masses through Out-of-Home media. Our IOS Team interacts closely with our clients, on a partnership level, to produce comprehensive strategic solutions that will capture and capitalize on your market. Our outdoor advertising products and special event packages deliver high powered visual impact that create not only a great first impression, but a deep and long lasting impression to keep buyers returning again and again. However, we specialize in customizing and tailoring our products to meet the specific needs of our clients with turn-key events including the storage, setup, and takedown of all necessary materials. We specialize in grand openings, sales events, and all forms of outdoor advertising. We tailor our approach to suit each client; to obtain massive brand awareness with pinpoint accuracy, while ensuring the best advertising result. In summary, 1-800 Great Ad provides solutions using out-of-home media to drive traffic, create visibility, and increase sales.